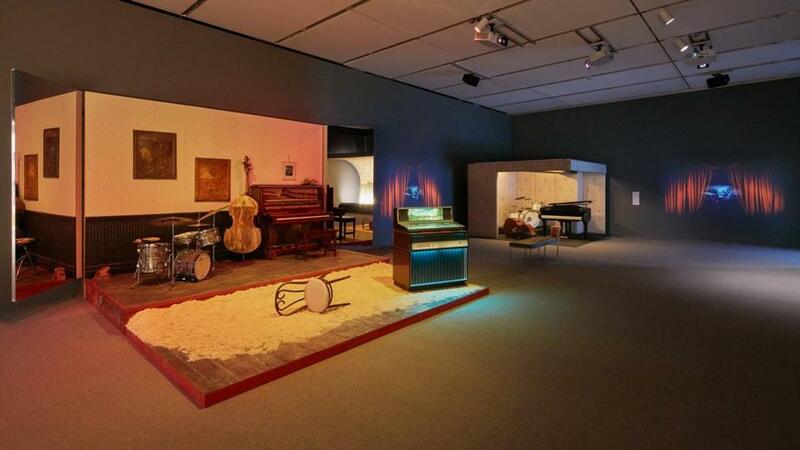 Jazz history is at the heart of Jason Moran’s ICA exhibition. There’s a convivial air to Jason Moran’s show at the ICA, and while that’s hardly by accident, it feels loose and natural all the same. From somewhere out of sight, your ear registers friendly chatter, the clinking of glasses, laughter, applause. It’s almost as though the artist is sharing some conspiratorial sympathies: You’re in an art museum, he seems to be saying. But it’s OK. Loosen up. Moran, a jazz composer and pianist whose collaborations with art-world superstars over the past decade have led, organically but windingly, to this, his first museum show, might feel a little out of place himself. There are many things to love about this exhibition — and we’re getting to that, I promise — but chief among them is this. The show — and the ICA, and especially the Walker Art Center in Minneapolis, which created the show and started this whole thing in the first place by bringing Moran inside as an artist in residence a dozen years ago — makes a declaration: that difference matters, and that the old rules of what belongs in an art museum are dissolving by the day. The ICA itself serves as a bit of a poster child for that very notion at the moment. Just across the hall, “Choreographic Objects,” a set of experiences aimed at testing viewers’ physical limits crafted by William Forsythe, a masterful modern choreographer, is among the least conventional museum offerings of the year. It’s also one of the most popular, jam-packed day to day, which tells you something. Moran holds his own, but in a very different way. From the look of things, it’s an exhibition of three big installations, but that’s only part of the story: One, a huge, brocade-lined arch fitted with stage lights and cradling a tiny harp, sits near the entrance; the second, a ramshackle stage mounded with sawdust, sports a ragged piano, cello, and drums sitting idle on cracked floorboards; and the third is a corner of wall and ceiling fitted with thickly-quilted acoustic padding, a baby grand piano tucked inside. All around, there’s that whisper and laugh, leavening the often library-esque air of an art museum with an inviting breeziness (the sounds, compiled by Moran from various club performances, emanate from a small antechamber, where a tableaux of photographs he took in those same venues plaster the wall). It all gives the sense of something slightly haunted, the past lingering, however affably, in the present, which is exactly as Moran intends. Those three big installations are specific, staging grounds for old ghosts: That arch comes from the Savoy Ballroom, a hub of the Harlem big band jazz scene in the ’20s and ’30s, and a musical home for the likes of Duke Ellington and Ella Fitzgerald; the padded walls mimic the stage at the Three Deuces, the midtown Manhattan club that served as the cradle of bebop in the ’40s; and those rough floorboards played host to the likes of Sun Ra’s Arkestra at Slugs’ Saloon, an Alphabet City incubator of free jazz in the ’60s and ’70s. For a musician, any musician, this is all hallowed ground — altars, really, in sacred space. That they no longer exist seems a certain sacrilege, and this is where I think Moran’s larger project comes together. Through music, Moran’s project is really about history, and African-American history in particular. It’s no great stretch to say that jazz is emblematic of black culture at one of its key apex points — wildly original, experimental, liberating, a standard-setting catalyst for musical innovation. That so many of its sacred spaces no longer exist tells another side of the story — of marginalization, of the exclusions of official histories — and the convivial air here becomes funereal in a hurry. The idea of sacred space in black history is a favorite subject of another African-American artist, the much-celebrated Theaster Gates, and on a voluminous loop of videos that play in the main gallery, Moran and Gates endearingly muddle their way through a collaborative performance. Like the other videos in the loop, though — Moran working to provide music for artists like Joan Jonas, Carrie Mae Weems, Kara Walker, and others — it feels a bit remedial, name-checking bonafides to prove Moran belongs. It’s unnecessary. Moran’s work blends form and experience, infusing deep research and thoughtful narrative with an authentic vitality and frankness that, to me, shows he has nothing to prove to any art audience, anywhere. Speaking of deep and thoughtful, two powerful videos are tucked in small rooms off the back of the main space. They’re too easy to miss,but be sure you don’t. Together, they form a crucial polemic, one hopeful, the other desolate, that colors all of Moran’s work here. Watching “The Death of Tom,” a 2009 abstract video piece by Glenn Ligon, the African-American artist best known for dark, satirical works that push back against black stereotypes, feels like standing in an icy wind: Angular shadows and light play across the screen, sharp but fluid, as Moran’s minimal piano score plays. Ligon had intended to make a film based on the 1903 movie “Uncle Tom’s Cabin,” in which black characters were played by white actors in blackface. But the film was loaded in his camera improperly, and the images you see here — incoherent, bleak, broken — are the result, which, Ligon decided, seemed a fair representation of the subject. It is bleakly, achingly beautiful, while Moran’s score is a ghostly accompaniment, chimes tinkling in the chill wind — barely there, like the film, and all the more haunting. It might stand to reason, then, that the video — a complete, musically orgiastic fiction — conjures up a cross-cultural utopia. Set some time in the mid-’70s, judging by the taper of the pants and the flare of the collars, “Luanda-Kinshasa” is a free-flowing six-hour-long afro-jazz-funk-worldbeat jam session so warming and seductive that its indulgent time span seems perfectly reasonable. Long, long shots pan from studio musician to studio musician — black, brown, white; man, woman — forming a kind of Age of Aquarius musical rainbow coalition. It’s exuberant, connected, utopic, and joyful. I wanted to live inside it. I wish I could. Moran’s NEC Slugs Ensemble will perform at the ICA on Jan. 19 at 2 and 3:30 p.m.